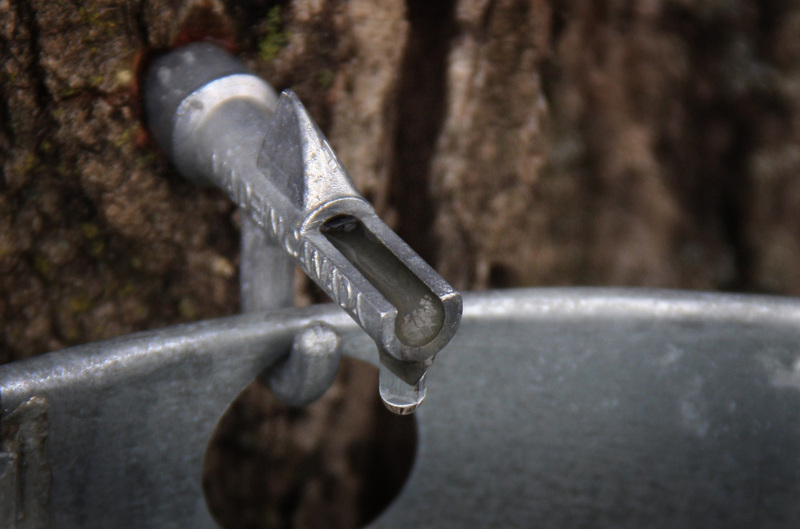 Late March in Vermont can mean only two things: mud and sap. Perhaps we’ve been spoiled by global warming the last few years, but this year it seems like Spring is taking its sweet time. There are piles of crusty ice remaining on the north side of everything. A few brave crocuses have tried their luck, but the ground is still pretty hard. Where it has softened, it’s a dark chocolate goo that clings to shoes and tires. We’ve had a couple of 40-50º days this month, but it’s been a week-long stretch of 32º for a high and it’s getting kind of old. To compensate for our lack of natural rejuvenation, I’ve grown the last of the paperwhite bulbs, pruned the peach tree and forced the trimmings indoors, and my husband brought home some purchased daffodils from the flower shop, bless his heart. I’ve also been spending long hours by the warm stove. I’m not sure how it happened, or when, exactly. Somehow, I’ve become one of those people who mill their own flour and bake their own bread twice a week. Last summer, someone gave me several buckets of hard red winter wheat. I decided I needed to do something with them. I gave a few away, then my oldest daughter found out about them and said, “If only we had a wheat grinder, we could make our own flour!” She was doubly enthusiastic when I admitted that I had my grandmother’s very old mill. I’d never used it, never seen it used, and it came with no instructions. She persuaded me to give it a try, and it worked. Now, what to do with fresh whole wheat flour…. I began gathering recipes for bread. My mother-in-law makes truly fabulous whole wheat bread, so I started there. Her recipe was very good but called for things I couldn’t find locally (like dough enhancer) so I tried other, inferior recipes. Finally, I found one I could work with. Christmas came, and with it a new NutriMill wheat grinder. Wow- that is one superior machine! It was time to get serious. I refined my recipe till it was good enough to soften the heart of my carb-conscious husband. My four year old is a scientist, I think. He is interested in processes, especially ones that create things. 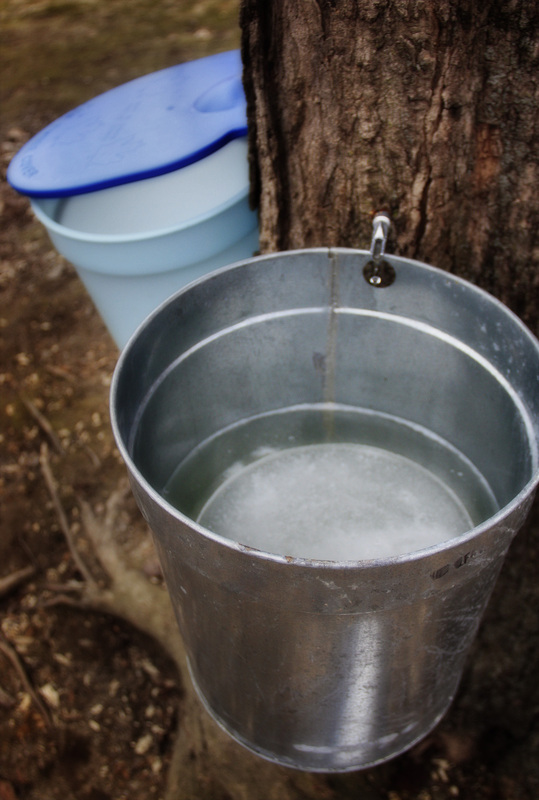 He asked if we could please, please, please make maple syrup this year so he could see how we make syrup from sap. I relented, cleaned out the old collection bucket and tap (from 5 years ago), and bought one more set to help speed things along. We drilled two holes in the grand sugar maple, and waited. A day or two later we had about 4 gallons and began boiling. 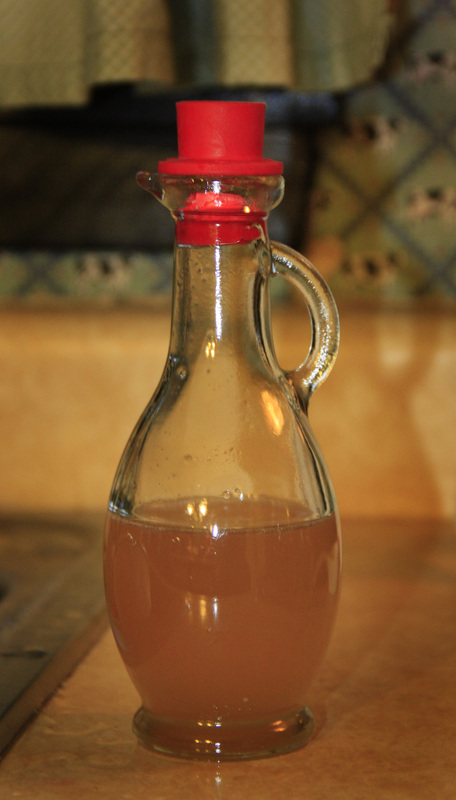 The first time I tried making syrup, it took 8 hours to finish and I was devastated by the massive reduction I witnessed, even though I knew the ratio of sap to syrup was about 40:1. Boiling isn’t exactly hard work, as Vermont activities go, but it does take time and attention (especially at the end) so one expects a more grandiose finale. But sugaring is not for those who require instant gratification. The finished product is so very Vermont-esque in nature: quiet, requiring patience, intensely sweet, priceless, and understated all at the same time. This time, I had a new stove to speed my efforts, and I started with two pots, reducing to one after about two hours. The total time for the three batches I have made this season averaged 4.5 hours. (It’s officially done at 7ºF above the water boiling temperature for your location.) I’m still perfecting a filtering system that doesn’t soak up the syrup and still gives a clear golden color, but I’ll figure it out. Sunday evening’s meal included fresh oat-flour waffles with a choice of homemade maple syrup or homemade red currant-strawberry syrup, and whipped cream. Everyone was very happy, which makes all the grinding of various whole grains and watching of boiling pots worthwhile. Besides, they’re good distractions while we wait for the world to warm up again. More process images on flickr. 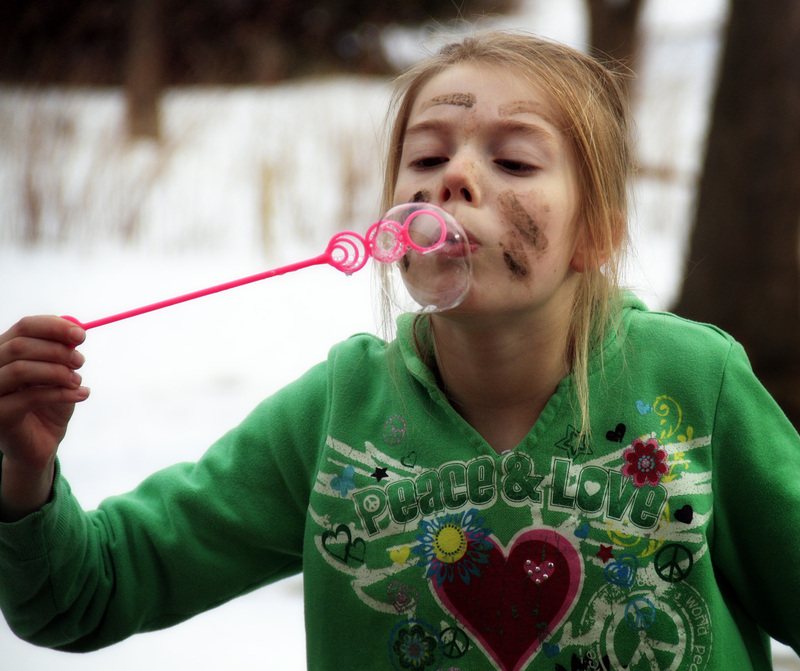 This entry was posted in Regarding Food, Spring, Vermont Journal by Maren. Bookmark the permalink.